The Lalapanzi Organic baby bed is cleverly designed to be used at home or to be toted to and fro on travels to make baby feel at home sleeping in her own familiar environment. Its soft side walls and oval shape simulate a mama’s womb — making the cozy bed a soothing spot for a cranky baby. Weighing just five pounds, the Lalapanzi baby bed is super lightweight which, when combined with its sturdy carrying handles makes it easily portable for road trips and air travel. So if you’re planning your summer vacation with baby in tow, the Lalapanzi bed could be your little one’s green crib while on the go! The Lalapanzi Organic baby bed is cleverly designed to be used at home or to be toted to and fro on travels to make baby feel at home sleeping in her own familiar environment. 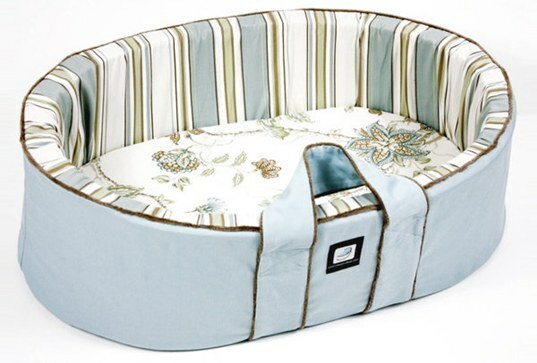 Its soft side walls and oval shape simulate a mama's womb -- making the cozy bed a soothing spot for a cranky baby. Weighing just five pounds, the Lalapanzi baby bed is super lightweight which, when combined with its sturdy carrying handles makes it easily portable for road trips and air travel. So if you're planning your summer vacation with baby in tow, the Lalapanzi bed could be your little one's green crib while on the go!